I haven’t too overly much to say about this book except: this book dragged. It was a trudge to force myself through this book, which is probably why not only did it take me quite a while to finish it, but I also read several other books before finishing it. Like usual, there were moments when you really wanted to see what was going on from one character’s perspective while jolted back to another character. While everything that happened was necessary, it seemed to take a very long time for anything in particular of substance to happen and stick. There are a lot of little victory, and some very heavy losses. The Dresden Files are the first books that Jim Butcher managed to get published. He is also the author of the Codex Alera, and a new steampunk series, Cinder spires. He is a gamer, including tabletop, video games, as well as LARP. He still lives in his hometown, Independence, Missouri. 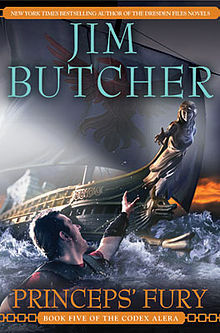 For a detailed biography of Jim Butcher, and a way to purchase his books, see his Amazon page.